January 16, 1974 The 86 foot John N Olof went on the rocks in Portage Bay and all four crewmembers were lost. The men; John Blaalid, Arthur H Gilbert, Ivar Gjerde and David A Gilbert were all from Kodiak. Winds were reported to 100 miles an hour and seas to 40 feet. February 15, 1974 The 80 foot steel tug Martin D capsized and sank February 15, 1974 in Sumner Strait near Wrangell Narrows. Three of her four crewmen were lost. Wind caught the barge that the Martin D was towing and blew it ahead of the tug causing her to capsize and sink. Lost were captain Jack MacKinnon, Jack Sanders (42) and Al Kite (51). Mike MacIntyre (22) was the sole survivor. 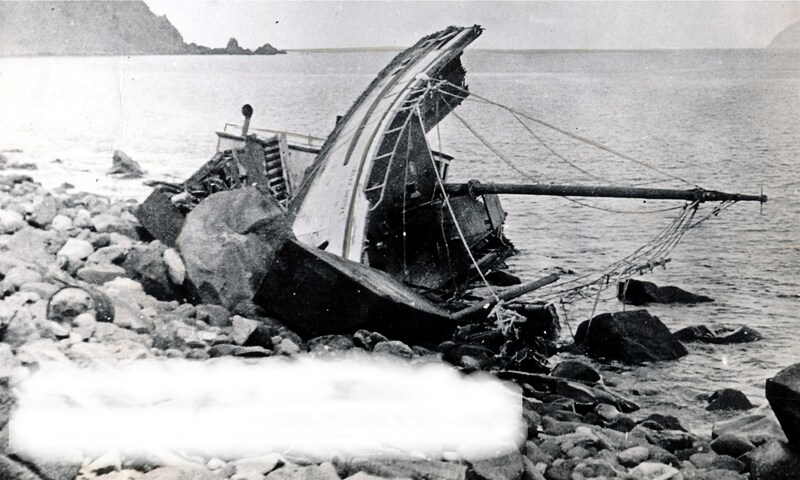 June 23, 1974 An unnamed riverboat capsized in a sudden storm with rough seas June 23, 1974 at Lutak Inlet near Haines. Seven people were lost. July 29, 1974 Gerald Lewis Ennisser (31) fell overboard from a small skiff and drowned while fishing in Steamboat Bay near Ketchikan. Crewmen aboard the Sea Rider reported that Ennisser had a life vest because he could not swim. He was found with one arm through the webbing of the life vest. September 9, 1974 Six people perished when an unnamed small boat capsized and was lost in Golovnin Bay, 90 miles east of Nome. October 9, 1974 Two were lost when an unbalanced small boat capsized in Gambier Bay on the east shore of Admiralty Island. November 4, 1974 Three people were lost when the private boat Tommy Boy went missing at Shelter Island near Juneau. November 24, 1974 The freighter Geranium disappeared with all hands 70 miles south of Kiska Island in the Aleutian Islands. 28 were lost in the disaster. An empty life boat and scores of logs were all that was ever found. December 20, 1974 An unnamed skiff was found running in circles off of Pennock Island, near Ketchikan. The vessel had signs of impact damage. One person was lost. I remember the storm well, I was on the Lucky Lady at the time, we barely made it in to Kodiak. It was cold and boats were making a lot of ice.,,Good site, thanks. I knew Dave Gilbert on the John N Olof pretty well. He left a young widow, if memory serves me, as did the others leave loved ones behind. About that time, I recall being on the Verona and running for harbor from another storm. Knowing all the while that if the wind switched we could be lost too. Still feel the loss these 44 years later. Rip Dave and Arty. God was watching out for me on the morning of February 14, 1974. In memory of my shipmates Captain Jack MacKinnon, the 1st Mate Jack Sanders, and my friend the cook who went down with the vessel and was never recovered Al Byra Kite. I hope your families found peace and closure. Your shipmate and brother. That was a very bad storm that winter. The day before your disaster, the shrimper Normar was lost over in the Shelikof Strait and the crew narrowly escaped as their vessel was lost. Some were severely frostbitten. The low pressure system passed below Kodiak as it worked east into the Gulf, so the winds were northerly off of the mainland. Icy winds over 70 is what the paper said, but in the places where the Normar and Martin D were they were likely funneled and increased. I guess you would call it a Taku wind over in Southeastern. I will email you the two newspaper accounts I have in my files, in case you don’t have them. Thanks for remembering Jack, Jack and Al; RIP to all three. Smooth Sailing to You. I remember the Tommy Boy, having working with the skipper and owner, Curtis Miller. He was a fine man and a conscientious skipper. He was also a fisheries student at the University of Washington. Sail on, Curtis. I was a senior in high school in Sitka in February 1974. I had already been commercial fishing for a couple years and also knew many of the tugboat crews, since my brother was working for Samson Tug, owner of the Martin D. I happened to be in the hallway when a man (friend or family member) came to the building to get Jack McKinnon’s daughter and tell her the devastating news about her father. I remember it like it was yesterday. It was a heartbreaking scene. I remember my brother telling me that Mike McIntyre had survived and that was a relief. I have found a news article about this tragedy and sent it to you. Thanks for bringing Mr. Nixon’s loss to my attention. I will be adding him to my lists of those “Lost at Sea in Alaska” shortly.